Will there be enough supply to meet the demand for health care? Supply and demand. It’s a key question in access to care. 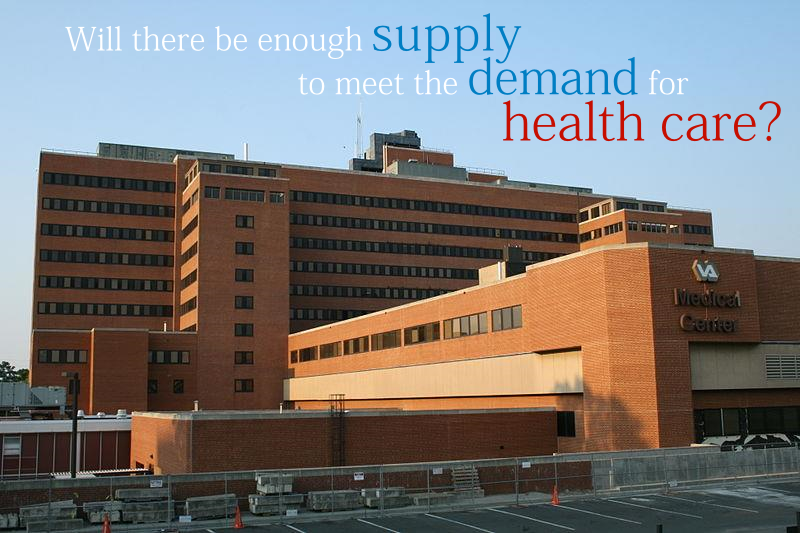 Are there enough supplies, enough medical personnel, and enough facilities to meet demand – or is there an excess of supply and a lack of demand? And how does Obamacare affect the supply/demand balance? Christensen states at the time of her writing that there is already a shortage of doctors, needing about 20,000 more to meet demand, that about half of our nation’s doctors are approaching retirement age, and that there is a shortage of nurses as well. We see a similar supply-and-demand issue in the recent VA scandal, with 120,000 veterans experiencing long waits for health care, including those whose scheduling information VA medical centers have falsified or mishandled, according to Dennis Wagner of azcentral.com. A recent round of audits have revealed that a number of VA facilities used unofficial scheduling lists in order to make wait times appear shorter than they really were. RT.com states that according to some, over 20 veterans have died recently because of long wait times for treatment. These issues raise important questions for our society. How can we encourage more students to become doctors and nurses with an aging population that will need them more? Can we effectively make health care more financially available while ensuring there is enough supply? Finally, how can the management of health care contribute to shorter waits to ensure that care is available to those who need it, especially those who have served our country? We must, more than ever, encourage and foster innovation and creative solutions for these major changes, legislated and natural, that are facing the American health care system today. Very interesting article Erwin. I have always thought that Doctors and Nurses shortage is an African problem. We in South Africa are also in the piloting stage for introduction of the National Health Insurance. The main challenge is finding enough health professionals to meet the demand. At the rate at which training institutions are producing these professionals, the status quo may remain for longer or even get worse. Good questions. We may need to look at other countries that have already made the shift from private insurance to universal health care for answers. Was there a major increase in demand for care? If so, was it uniform across all specialties and provider of services? Or was there a major increase in demand for primary care with less demand for specialist, ancillary and facility care. One of the criticisms of universal care are the wait times. Unless funding is going to increase substantially, access will suffer. There is already a transformation occurring in the US where greater emphasis is being placed on migrating services out of the hospital and to office based care and office based surgery. Insurers are also encouraging non-physician providers to take on a greater role in caring for patients by now agreeing to credential them allowing to maintain their own patient panels.. This encourages services to be provided in the most cost effective location and by the less expensive provider.